"My favorite meal for a hot summer day is my mother's yogurt gravy..It is very similar to the Sindhi Kadi..but much lighter...We have it with rice and it really helps cool down the system!" "My favourite meal for a hot summer day is amras with poli/chapati or shrikhand with chapati. This used to be our lunch often during the summer holidays." Congratulations to the winners! 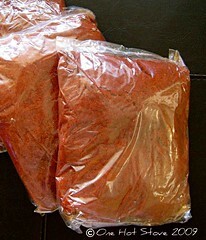 Serendipity and Namita, please e-mail me with your address and I'll send the masala to you within the week.